My daughter was getting married in July. She wanted me to make her wedding cake! 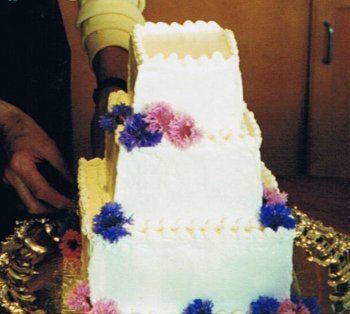 My neighbour had made her daughter’s wedding cake, so she became my “teacher”. We tested numerous lemon flavoured cakes from scratch (on the side there was to be mixed berries and ice-cream). We had many yummy lemon cake tasting parties! We settled on the Martha Stewart recipe for a 3 tier wedding cake. 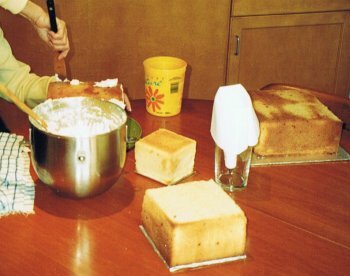 The cake design used three different sized square cake pans. We used a Kitchen-Aid stand mixer … it was very helpful as we had a lot of cake dough. 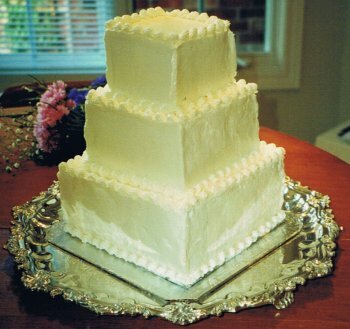 Here's how to make a homemade wedding cake. The day before the wedding we made the butter cream icing. 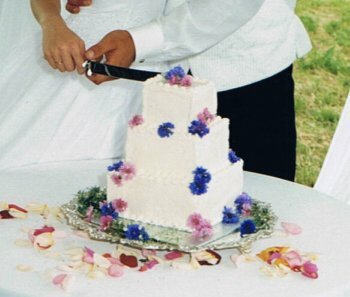 This simple wedding cake was decorated with pansies instead of a traditional wedding cake topper! It was perfect for her outdoor farm wedding. It also was a terrific memory for us!